For the second year, the Waynesville Middle School PTA has provided mini-grants to fund special programs, projects, items, and/or events that benefit individual classes, teachers, students and the WMS community. Local businesses and people in the community matched the funds. A total of $1650.00 was raised and funded all the teachers who applied. 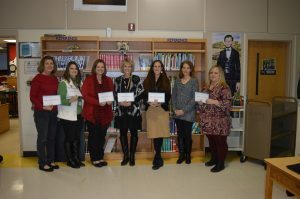 Each teacher completed a grant application, including items requested and funds required. The grants were used for things such as student incentives, computer programs, classroom materials and supplies for interactive learning games.